I finished this little set today (Simplicity pattern 3509). It's a dress and diaper cover set. The fabric was easy to work with and the project overall was easy and fun! It's for sweet little Hannah and I truly hope it fits her well. I really liked how the dress turned out. 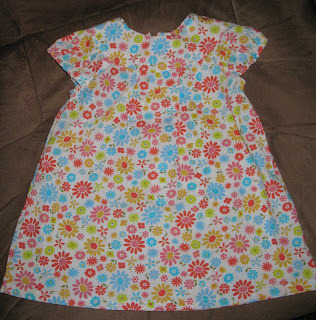 It is hard to see in the pic, but the sleeves are cute little cap sleeves with elastic in them. There is a zipper in the back. (Zippers are my nemesis, but this one looks okay) It's very simple, but I think very cute.